The Column Navigator add-in for Microsoft Excel helps you move around on worksheets that have many columns. It is compatible with Microsoft Excel 2007 to 2019 and Office 365. With just a click of the new "Columns" menu, a dialog appears that lists all the columns in your worksheet. You can have the Column Navigator show the columns in actual order or sorted by title in A-Z order. To go to any column, just click on the column description. To change worksheets, just click on the spin buttons on the upper left of the above dialog. 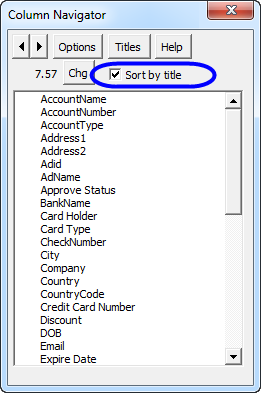 The "titles" button allows you to change the title rows to any rows you want. Multiple rows can be used as the column title rows. Once changed, the Column Navigator will remember the rows. If you wish to see your columns in sorted order, just click on the "Sort by title" checkbox. If you wish to see the column widths on all columns, just click the Options button and select the option to show column widths on all columns. If a column is hidden, an "H" appears to the left of the column title if widths are not displayed. If widths are displayed, hidden columns have a zero for their width.